While on a trip to Montana in late May 2014, I had the opportunity to visit a place called Rock City, just north of Valier, Montana. (see my recent post on that trip) In and of itself, Valier is not too exciting of small town but it is scenic as it borders Lake Frances, a great bird estuary. With my daughter, her husband and my grandchildren in tow, we ventured to Valier on our way to Choteau, Montana in order to take a ride out to “Rock City.” It is about a seven mile drive due north of town. This is not the same Rock City that is located near Chattanooga, Tennessee and has advertisements on barns all over the southeast as shown below. Instead, this Rock City is a natural “city” of rock formations that have been eroded away by the Two Medicine River. To get to Rock City you drive north towards Cut Bank out of Valier on Cut Bank Highway and as the road turns west, you continue north on gravel road (now Rock City Rd.) past Bullhead Rd. and then Dean Rd. and eventually onto a dirt road which eventually comes to a Dead End sign. You can go straight on the dirt, but note that it turns into a little dirt track that’s fairly bumpy and probably more suited to a four-wheel-drive or a large base vehicle. Pass Bullhead Road while on Rock City Rd. On the approach through prairie lands and farmlands, a big valley, indeed a deep chasm opens up in front of you. The Two Medicine River flows down below and it had quite a strong current at the time we visited due to all the glacier runoff from late spring. Hundreds of strange rock formations, called “hoodoos” dot the landscape, creating many eerie features. Hoodoos (mushroom-shaped erosional features in badlands) are caused by water from cloudbursts turning the corner at the brim of the overhang, flowing for a distance upside-down on the underside. This type of upside-down flow is well known as a “teapot effect” because it mimics tea being poured from a pot flowing down the underside of the spout rather than straight on into the cup. Many of the hoodoo formations at Rock City are 12 to 20 feet tall and most have the common “hoodoo” big flat tops on them indicating massive amounts of water and wind erosion over what I would assume is centuries of time. Some of the most famous hoodoo formations are common in Bryce Canyon National Park in Utah. 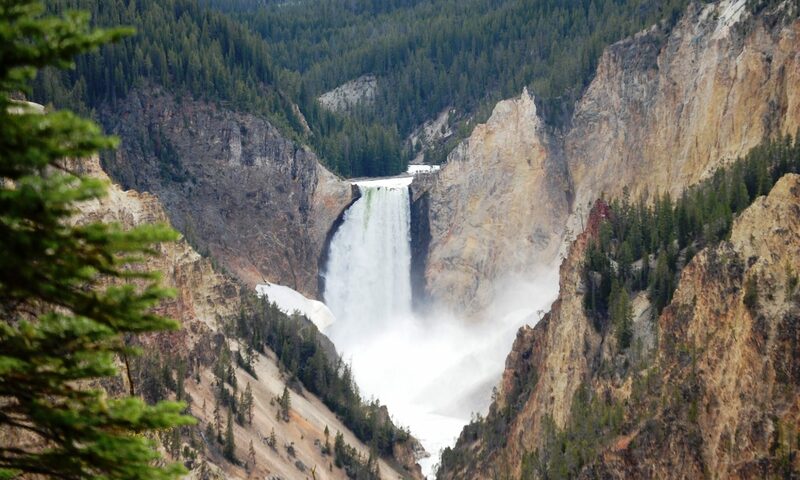 For the adventuresome person, hiking down to the river is probably quite possible as there are many locations that are not beholden with cliffs. On this occasion we walked around through many of the formations, but didn’t venture down into the canyon itself. To me, though much different in appearance, it was not unlike visiting Coal Mine Canyon which is located on the Navajo Indian Reservation east of Tuba City, Arizona on AZ Hwy 264 past Moenkopi. As a tour guide I took hundreds of folks down dirt roads (in a van of course) to see the hoodoo-like formations of this place. Like Coal Mine Canyon, it is an undeveloped geologic location that might otherwise be a National Monument or a State Park. But in both cases neither of these appear to be headed in this direction. Both require going down narrow dirt roads and paths to get to them. Both have unique and otherworldly formations. And both have big chasms with beautiful scenes. 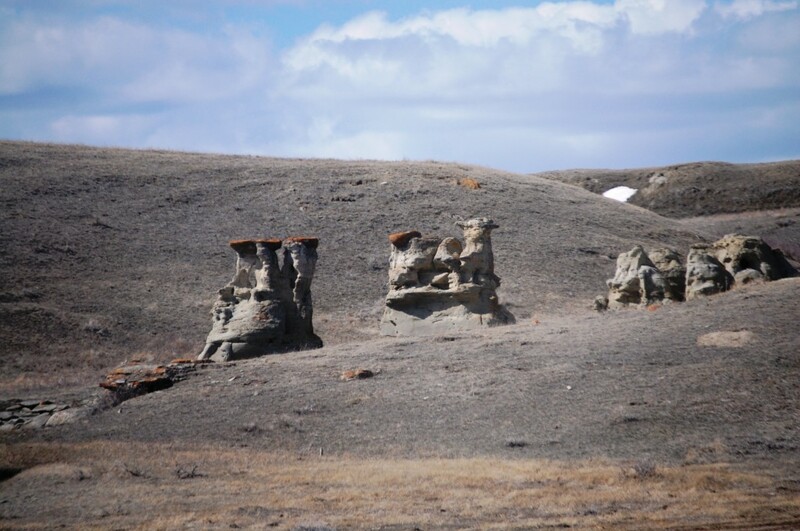 Up in northern Montana just south of Sweetgrass, there are some similar formations called Jerusalem Rocks. I visited there in January 2012. These are also hoodoo-like in nature, but the grouping of the formation is not nearly as expansive as Rock City. I find all of these out of the way, eerie places to be fascinating and fun to visit. And especially so with grandchildren! If you are ever in the Great Falls area and have an extra day, I highly recommend a drive up US 89 north and then a jaunt over to Valier and Rock City. You’ll be glad you did. As I continued my trip in Montana, I spent some time with my daughter and her children in Shelby. From there I proceeded to head back to Kentucky the “back roads” way over a number of US Highways and State Highways. My goal was to travel the majority of Montana’s US 89 during this trip. I did not hit the portion north of Browning to Alberta on this trip, though I have traveled it in the past. In fact, over the years I have traveled US 89 from the Canadian border all the way to Mexico (back when US 89 went that far). This post will cover the section of US 89 north of Great Falls and I will follow with a second post covering the portion of US 89 in Montana south of Great Falls. Sometimes called the National Park Highway, U.S. 89 links seven national parks across the Mountain West. In addition, fourteen other national park areas, mostly national monuments are also reachable from this backbone of the Rockies. The highway goes through prairies, mountains and deserts and, in my opinion, is the most scenic US Highway in America. My wife flew out to Montana so I took her down to Great Falls and spent the night there. The next morning she had an early flight, so I dropped her off and then headed north on US 89 from Great Falls and would travel all the way to US Highway 2 near Browning and then back to Shelby for one more night with the family. US 89 near Great Falls merges with Interstate 15 until Vaughn, Montana, where it cuts northwest towards Glacier National Park. In the early morning, this is a fabulously beautiful drive along the eastern edge of Glacier. The first town along US 89 north is Fairfield, where the highway continues northward. I pulled into town on an early Monday morning and things were still quiet. Like many small Montana towns, there are old neon signs, old buildings and a unique personality. Fairfield is also the southern gateway to Freezeout Lake, which can be seen from US 89. This lake is a spring home to snow geese and swans as they fly north to Canada in the spring. I drove by a bit late to see the swarms of birds, but I did catch a couple of bird shots as I drove by. Route 89 continues north into beautiful country on the approach to the town of Choteau, which is a southwestern gateway to Glacier (the town refers to itself as “The Front Porch to the Rockies”). A metal cowboy sculpture on a hill south of Choteau, Montana is silhouetted against the morning sky. The town is the northern terminus of US 287 which actually starts in Port Arthur, Texas, about 1,791 miles away. (I actually drove a good portion of US 287 on a previous trip to Texas from Dalhart through Amarillo and Wichita Falls into the Dallas area.) As I pulled into Choteau from the south I was greeted by two grumpy looking cowboys (in the Ace Hardware parking lot). I contacted Ace owner Steve Nyland to inquire about the pieces and learned that they were made by Lincoln, Montana born artist Rick Rowley who now runs the Lost Woodsman Studio in Sedona, Arizona (which, by the way is ALSO on US 89 in Arizona) and is world renown for his art. Choteau is home to a beautiful old courthouse, a 70s style motel and a few other unique things. It is also home to a unique little museum called the Old Trail Museum, and is one of 14 stops on the Montana Dinosaur Trail. They even have three big dinosaur statues outside of the museum. The folks at the Old Trail Museum are ultra friendly and there is a lot to see there including paleontology exhibits, grizzly bear exhibit, an art studio and a luscious ice cream shop! A great place to bring the kids…and that is why we came with the grand kids. The next town north of Choteau is Bynum, Montana. The town is home to yet another dinosaur museum, the Two Medicine Dinosaur Center, another Dinosaur Trail stop. The center includes the world’s longest dinosaur, a skeletal model display of a Seismosaurus, according to the Guinness Book of World Records. Other displays include the first baby dinosaur remains found in North America and the actual remains of other new dinosaur species. This is another one of those very small towns, but it does have a unique character in that it has a dinosaur museum in a giant T Rex that you can see from the highway. Great for a photo opportunity! J.D.’s Wildlife Sanctuary in Bynum. Apparently known for its steaks. Another few miles up the road US 89 meets Montana 219 which leads to Pendroy and then on to Conrad on Interstate 15. Pendroy, Montana is a sparsely populated little place. My biggest excitement about Pendroy was the discovery of some unique yard art outside a house there. It included a wind chime made of oxygen tanks, a metal bear sculpture, a metal gal on an old tiller and more. The drive north on US Route 89 really offers some spectacular views of the mountains to the west and they are extra beautiful when the sun is coming up. The next town on US 89 is the historic town of Dupuyer, Montana. The sign below says it all, calling is a “colorful cattle town” and the “oldest town between Fort Benton and the Rocky Mountains.” I found it to still be colorful. While driving into Dupuyer, I noticed a unique cemetery on a hill west of town with the flag flying high and the Rockies in the background. I decided to veer off the road a bit onto Dupuyer Creek Road and catch some of the scenery and was glad I did. The road was also lined with colorful wildflowers all on bloom on this early morning. Then, what struck me as fun was the “Boot Fence.” I had seen one similar on a highway in Idaho in 2013. Each post had its own boot on it. I have also seen it in Texas. I wondered about the tradition and found a few write-ups about the tradition. A search in Google images shows dozens of photos of boots on fences. Sometimes, a rancher will put boots on the fencepost to honor the passing of a beloved horse, a hired hand or fallen comrade. Also, before telephones were invented, a rancher would indicate he was home and the workday was over by hanging boots on the fence. Whatever the reasons, it is an interesting tradition in the west. Finally, back on US 89 I was tempted to visit the Dupuyer Cache, but they were still not open when I drove by at 8:45 AM. Dupuyer Cache sells yarn, honey, books, groceries and more. To get to Rock City you drive north towards Cut Bank out of Valier on Cut Bank Highway and as the road turns west, you continue north on a dirt road which eventually turns into a little path that’s kind of bumpy and probably more suited to a four-wheel-drive or a large base vehicle. On the approach through prairie lands and farmlands, a big Valley, a chasm opens up in front of you. The Two Medicine River flows down below and it was quite a strong current at the time we visited due to all the glacier runoff as spring had gotten started. Hundreds of strange rock formations dot the landscape, creating many eerie features. Many of the formations are 12 to 20 feet tall and many have big flat tops on them indicating massive amounts of water in wind erosion over but I would assume is centuries of time. To me, though much different in appearance, it was not unlike Coal Mine Canyon which is located on the Navajo Indian Reservation east of Tuba City, Arizona. Like Coal Mine Canyon, it is an undeveloped geologic location that might otherwise be a National Monument or a State Park. But in both cases neither of these appear to be headed in this direction. Both require going down narrow dirt roads and paths to get to them. Both have unique and otherworldly formations. And both have big chasms with beautiful scenes. Continuing north on US 89 I entered the Blackfeet Reservation at its southern entrance. And, similar to the East Entrance in Cut Bank (see photos in THIS POST), there are two scrap metal Indian Chiefs that greeted me. The same artist, Jay Polite Laber has put these sculptures at all four directional entrances to the reservation. From this location looking west, one can see the grandeur of the massive snow covered mountains of Glacier National Park. As I returned home from my long nine-day trip across America I wanted to take a quick look back at all the events. Over the course of this trip I have covered 12 states, over 4600 miles, taken almost 2000 photos (including over 100 “selfies” and have seen all kinds of things. The big highlights of this trip were visiting the Paul Bunyan and Big Blue in Bemidji, Minnesota, driving up the Beartooth Mountains in Wyoming/Montana, and hitting Carhenge in Nebraska. The Beartooth Mountains were breathtaking! Along with these, I saw many other interesting places. I had numerous oddball sites along the way including a pink elephant, big bears, Jackalopes and many other roadside attractions. This trip took me along many US highways as I generally avoided the interstate whenever possible. I was fortunate enough to drive a big chunk US Route 2: all the way from Ironwood, Michigan to the eastern edge of Glacier National Park where US 2 intersects with US 89. That route has some amazing scenery, lots of variety and other wonderful things. As with most of my trips, I also captured the abundance of wildlife, some of which I was able to photograph. I had close-ups of deer, antelope, bison and a few waterbirds. I drove through the wetlands of Minnesota, the marshlands of North Dakota, and the sandhills of Nebraska, all of which had an abundance of waterfowl. I was fortunate to have the opportunity to meet some amazing people along this road trip. I met some expert woodcarvers in Wisconsin and I met with rice growers in Wisconsin. I had a long talk with the people in Bemidji, Minnesota. While in Douglas, Wyoming I got to meet with the people there about the Jackalope got my “official” Jackalope hunting license and other goodies from them. At Hell’s Half Acre in Wyoming I met a photographer from Wisconsin who also writes blogs and has many similar interests in travel. I hope to exchange stories and photos with him. Then at Carhenge I met a time lapse photographer and some other interesting people and even donated my MARDUP (Married Up) license plate to the Carhenge gift shop. I don’t want to forget the small Old Trail Museum in the small town of Choteau, Montana with dinosaurs and other unique things. As with most of my trips, I didn’t visit all of my planned locations. But along the way there were many in expected surprises that I ran across. These are what really make these trips worthwhile! Perhaps two of my most exciting surprises were visiting Rock City in northern Montana ( with my Grandkidz) and Hell’s Half Acre in Wyoming. Both of these are basically uncharted geographic and geologic formations that are really amazing. As always, I was delighted to be around the mountains! I was fortunate to be able drive along the eastern rim of Glacier National Park at sunrise and see the beauty of the snow-covered mountains there. Driving down US 89 from Shelby towards Yellowstone, I saw an abundance of wonderful mountain vistas. Then one of my bucket list trips was accomplished on this as I drove the Beartooth mountain range which sits atop the border of Montana and Wyoming. That was an amazing adventure as I drove all the way up 11,000 feet to the “Top of the World” as they call it there. Deep snow surrounded the roads and the vistas looking down on the mountains were absolutely breathtaking. This trip will actually provide me enough content to warrant a number of blog posts for me as I visited so many locations and saw so many different things. In the past, I have tried to throw it all into one giant blog. But this time around I met with people and I dug a little deeper and took more pictures of various locations so that I can focus on the smaller picture items. For sure I will have blog posts about US Route 2, US Route 89, the Beartooth, Bemidji, Douglas, and probably a few others. With the new technology of wireless devices, I was able to take a lot of “selfies” along the route. My goal was to get 100 selfies, but I actually got 96 on this trip. Using Instagram, I hash tagged them with #100selfies and shared them on Twitter, Facebook and other social sites. Ultimately, I plan on a “100 Selfies” blog post including all of the photographs and the stories behind them. Of course, I cannot neglect noting the real reason I took the trip which was my grandson Kade’s baptism. It was amazing to be able to spend time with my four grandchildren and my daughter Amaree and her husband Aaron for four days in Shelby, Montana. During the course of this trip, I probably took over 2000 photographs. Much of them were scenery and unique sites. But I also captured the sense of the fading America – the old neon signs, the old abandoned houses and barns, schools and churches, the small-town theaters and their marquees. I captured small-town murals and Wall art. For me, these trips are not about the destinations. These trips are about the experience. It is all in the trip! This nine-day adventure, as with other long trips I have taken the past couple of years, will leave me cherished memories to the day that I die. Watch soon for detailed posts about the trip.